Last month a dinosaur footprint was stolen in Utah. This week Brazil announced that it is cracking down on the illegal fossil trade. 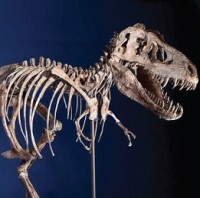 For several years debate swirled around the smuggling of a complete Tarbosaurus bataar skeleton into the United States from Monogolia, leading to arrests and repatriation. Most fossil collectors play by the rules and follow the law. But not all of them do and they are who we should worry about. Fossil trafficking is big business and it is also a big deal. That there is a thriving international trade in both legal and illegal fossils might come as a surprise. Who has room for an entire dinosaur in their house? More people than one would think, but the bulk of the fossil trade is made up of small pieces: ammonites, fossil fish, shark teeth, petrified wood. In the grand scheme of science, these minor pieces don’t really matter much, however their removal from the ground is often destructive and may just be illegal. But what does ‘destructive’ mean in this case? When a fossil is taken illegally from the ground we lose vital information about the environment in which the organism lived and died in. We lose context. For example, if a fossilized nest of dinosaur eggs is looted and the eggs sold individually we can’t tell how the nest was arranged. In other words we miss our chance to learn about dinosaur behavior. Looted fossils are often poorly excavated and poorly restored and evidence for delicate structures such dinosaur skin, organs, and feathers can be lost because they were not preserved by a professional. Although many fossil collectors and enthusiasts have a strong interest in science, they are not scientists. They do not engage in the rigorous inquiry that is the backbone of palaeontological research. The fossil market is a parallel world. Some palaeontologists engage with the trade and collectors, but they do so to examine specimens that they would otherwise have no access to. These researchers see the fossil trade as a necessary evil which exposes specimens that would otherwise not see the light of day due to budgetary restrictions on excavations. Some palaeontologists dismiss the trade as bad for science, but engage with it anyway to make the most of a rough situation. Everyone agrees that the worst case scenario is when a fossil is lost to a private collection and cannot be studied. No law forces private owners to share their collections with scientists and no law prevents privately held pieces from being modified or destroyed. One of the difficulties in regulating the global illicit trade in fossils is that national laws are often not compatible. What is illegal in one country is not necessarily illegal in another. In the United States a fossil is like any other ownable thing: if it found on private land it can be bought and sold, but if it is found on public or federal land it is property of the state. In contrast, many Latin American countries consider all fossils to be the property of the state, even when found on private land; fossils cannot legally be bought, sold, or exported. Some Latin American countries even define fossils as ‘cultural heritage’, and regulate their ownership, sale, and export with the same laws as they do archaeological artifacts. Defining fossils as ‘cultural’ items is interesting and controversial. Some argue that fossils are purely natural items and that equating them with the cultural remains of the human past is absurd. Yet this argument ignores the very qualities of these objects that make regulation of the fossil trade necessary: Buying, selling, and collecting fossils are cultural activities. Furthermore the looting of fossil beds, such as in the case of the Utah dinosaur footprint, is cultural as well. When a fossil is damaged or stolen to feed the illicit trade we lose not only an avenue of scientific inquiry, but also an object that can be experienced and enjoyed on a cultural level. We lose a family trip to the museum, or a walk along a prehistoric foot path, or a source of tourism income, or a book to read our children at night, or a story about mass prehistoric whale deaths to read with our morning coffee. The past is owned by everyone and everyone is the victim of this crime.